This article in ReSource magazine looks at the ingenious machine that can convert plastic junk into fuel and solve some of Africa’s environmental problems. In an effort to address the problem of plastic waste, deforestation and the continent’s energy crisis in one fell swoop, not-for-profit organisation Alliance Earth has created an incredible engineering solution that converts plastic waste into energy. The UN Environmental Programme says that around 8 Mt of plastic waste ends up in the world’s oceans each year. That’s the equivalent of a garbage truck full of plastic being dumped into the ocean every minute. At the same time, sub-Saharan Africa is facing wood fuel crisis with massive environmental consequences, as the most dominant energy form for cooking and energy for many communities remains wood. The Dung Beetle Project aims to address these and other challenges in a fun and innovative way using art, education, and technology that has existed for almost 100 years. The solution – a plastic gasification system covered by a steel structure in the form of a dung beetle – uses pyrolysis to heat plastic into a gas and then condense it back into usable fuels. “The Dung Beetle is really just a package to deliver what is essentially one of many solutions to a planetary crisis we face with the amount of plastics in our environment,” notes Jeffrey Barbee, environmental journalist, and director of Alliance Earth. “The reason we packaged this solution as a dung beetle is because not only are dung beetles rather fabulous, but they do the work that most organisms overlook as probably beneath them. They take waste and turn it into something useful, which is what our Dung Beetle does. “If you think about it, people have made this system before; what we created here, we literally learned from YouTube – we have not done anything new, this type of technology has been around for at least 100 years. What we looking at here is adapting one solution to the plastic problem into a communications platform that is fun, fiery and hopefully unforgettable,” he explains. 40% of plastic produced is packaging used just once and then discarded. 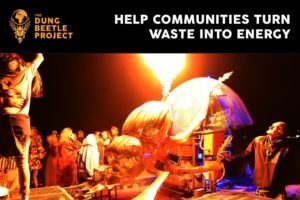 The project has become a centrepiece for climate change and environmental education and has garnered much attention since its debut at the AfrikaBurn arts festival in the Karoo earlier this year. The Dung Beetle was mounted on a trailer, along with a stage that allowed for a production that included live performances by artists, as well as talks and tours of the gasification technology. “We chose to present this project as art because art is communicative in so many ways. When you’re talking about environmental education, it’s really important to engage people at many different levels. As the Beetle travels around the country, it uses the syngas it creates to power the lights and speakers for the roadshow. The syngas also fuels two torches that burn and shoot flames 2 m into the air out of the Beetle. The truck towing it is also powered using low-emission biodiesel. Barbee notes that South African townships are plagued by a pollution problem on multiple levels. “Many people eat lunch at street-side cafes, many of which use just a three stone wood fire. Sometimes they even use anthracite coal for cooking food. “These things already have a heavy footprint problem but when you see the kind of air pollution that you see in South Africa’s townships, particularly in the winter time, with people using whatever forms of energy they can to cook with, it’s a no-brainer that a heat system with no release of hydrocarbons into the environment would be extremely beneficial. According to Barbee, the new project will be based in the south of Johannesburg and will retrain people who have been put out of work by the mining industry to build Dung Beetles. “The aim is to create an alternative energy stream market that essentially monetises these types of systems and puts that energy and money into the hands of small-scale entrepreneurs in Southern Africa. The aim is to have a much larger ecological impact in terms of pulling plastic out of the environment,” he says. “The reason we are opting to lease and not sell them is so that we ensure that we hold on to the ability to innovate and make these systems cleaner, better, more efficient and more successful at removing plastic from the environment,” Barbee concludes. 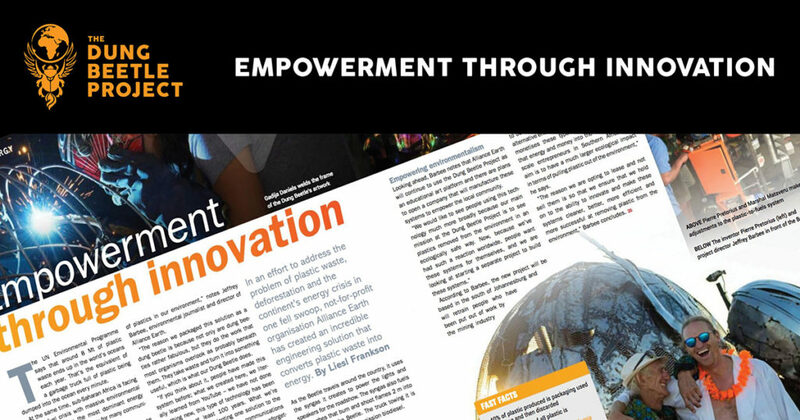 This article written by Liesl Frankson first appeared in ReSource in August 2018. This entry was posted in Blog, News and tagged cleaning up the streets, Creating employment, making fuel. The Dung Beetle can run a generator to electrify a small house and still make diesel for other uses.